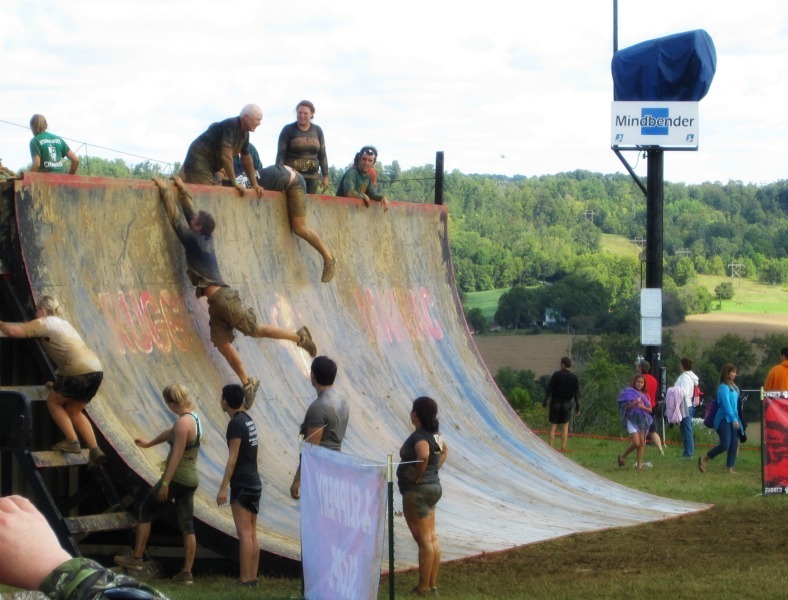 Infuse substantial amounts of cash into an obstacle race that was already pretty solid and the result is an improved race with bigger and better obstacles. The fortunate recipient of cash from Shark Tank investor, Mark Cuban, Rugged Maniac stepped up its game, while still remaining within it’s market niche of a notch just slightly above entry level. I was happy enough with the 2013 Southern Indiana Rugged Maniac at Paoli, but was more than pleasantly surprised with the upgrade. The course itself was similar with several relatively short ups and downs along the mountains (actually, large hills), interspersed with some flat treks, and a decent stretch of a 4 foot deep creek. The terrain was marked well and much of it had been dozed or mowed. Keep your eyes down and ankles ready because it is a fast course. Quintuple steps (think American Ninja Warrior, except wooden and on the ground as opposed to water) [Note: I didn’t like these because doing them with wet/muddy racing shoes is a recipe for a broken ankle. The steps didn’t really add anything to the race and were more of 2 second long nuisance than an actual obstacle. For me, this was another comeback race to test my ankle after more rehab and training. I finished in 6th after battling back and forth with OCR friend, Devon Brown for most of the course. The push at the end to finally get away from him almost resulted in me vomiting before I finished. I would have completed the course 2 to 3 minutes longer and several places back if he hadn’t been there to push me. 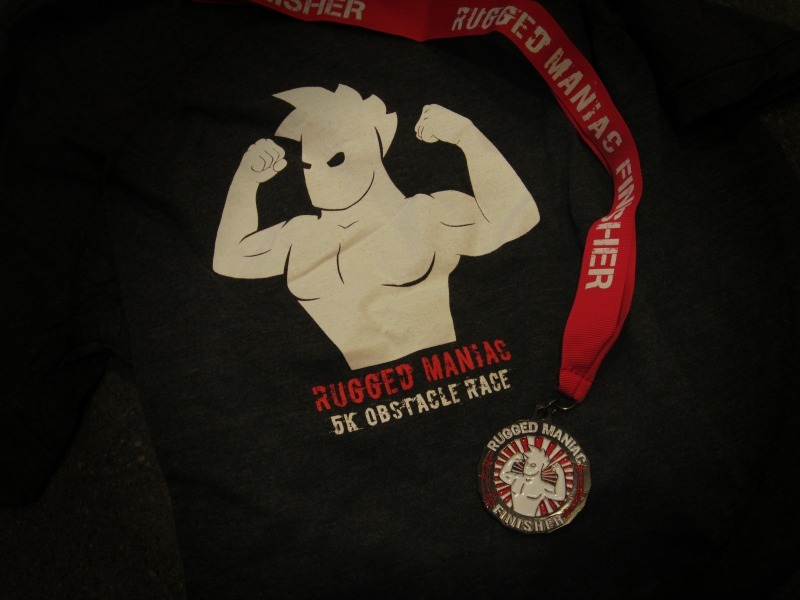 Finally, a trivial thing to me, but significant to some…..Rugged Maniac now gives out finisher’s medals. Previous Mud Guts and Glory delivers again! It is great to see you racing hard again. In our first races this year I felt cheated since you weren’t at full strength. This race was an epic battle and now I’m pumped to chase you again soon at OCRWC. I completely agree with your assessment of Rugged. I still would like to see penalties installed (time or physical) for failed obstacles (as you saw I slipped on the rings and would have felt cheated to beat you across the finish line since you didn’t fail). They are one of the few races that are still entertaining for competitive racers while doable and fun for beginners. The warped wall was great in that competitive heat went it alone and later heats built teamwork. Great to see you back friend but be warned dyer returning from VT you will be in the front of my training mind!!!! I’ll be ready and waiting! Wow. I haven’t done a Rugged since 2012 (NJ and NYC) because they were, well, kinda lame. Sounds like they’ve upped the ante and I’ll have to think about making that long drive to Englishtown again.